Over the next few months, during our off-season, we’ll be sharing some of our most popular weddings from past years with y’all, starting with Logan and Dusty’s! 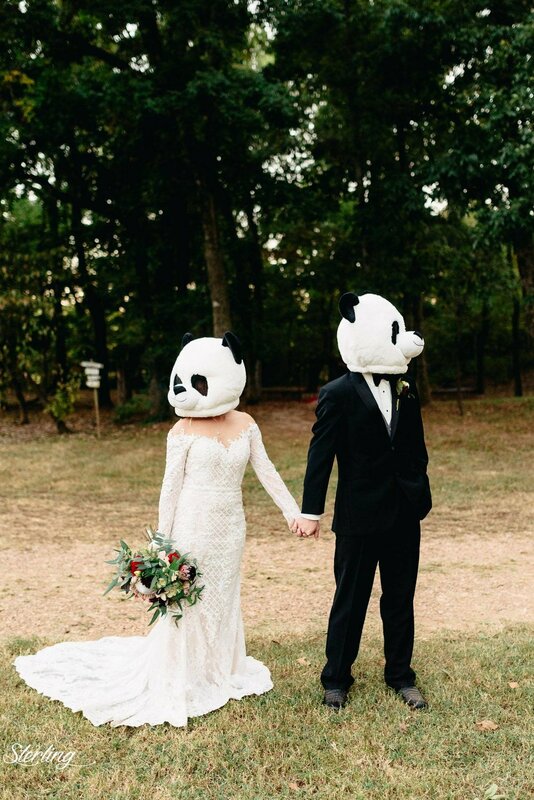 We’ll keep sharing our fall 2018 weddings, too, just as soon as we get all the photos back. But we hope you’ll love looking back on some of our fan favorites that you may have missed! We still ADORE every part of this one! This wedding is extra special, because the bride is Lesleigh's (The Barn's Owner and Creative Director) sister. 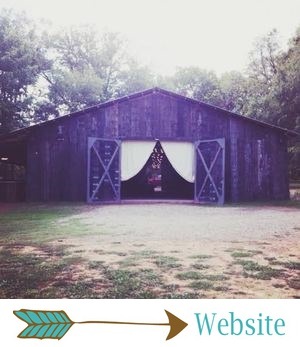 Being a member of The Barn family, Logan is super familiar with The Barn and all of its gorgeous weddings. She wanted something unique, and Lesleigh and the team went ALL out creating a dream wedding unlike any other we've done before! Sterling Imageworks Photography - some of our absolute favorite photographers to work with - did such a beautiful job on this sweet couple's photos, just as they always do! We will also be sure to share their video from Branchout Studios with y'all in the near future. Logan and Dusty were married at The Barn at Twin Oaks Ranch on September 30, 2017. 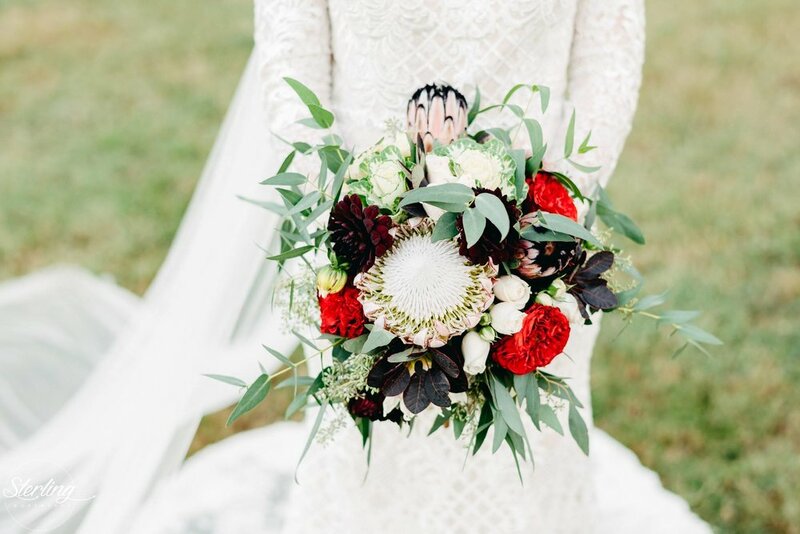 Their color palette started off as a gorgeous combination of lots of greenery with touches of ivory, burgundy and gold. "The more I thought about it, the more I realized how much I wanted black," Logan said. "I would ask my friends and family and they were on the fence about it. Lesleigh told me I should do what I really want and it will look good regardless, so I went with black!" You should ALWAYS go with what you really want! Adding black to this color palette totally paid off - it was elegant, unique, bold, and SO unique! 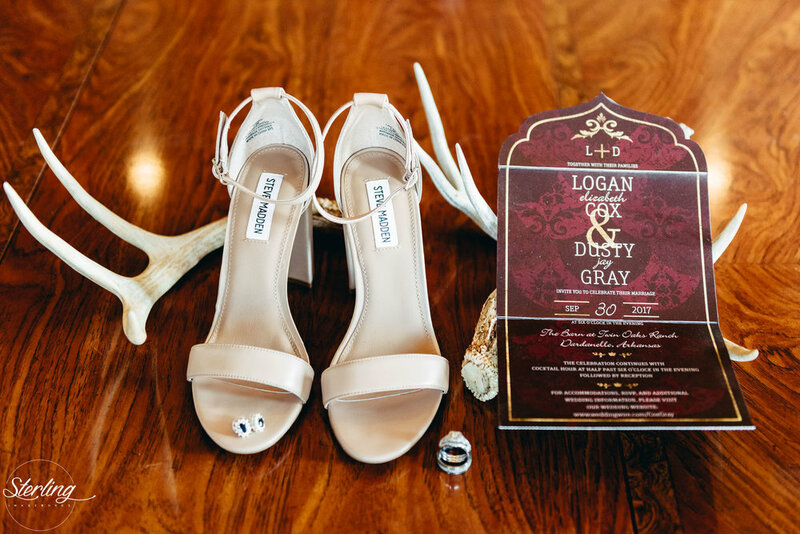 Logan and Dusty's florals were unlike any we've done before! "I loved a picture that I saw on Pinterest of a bridesmaid holding a strand of garland," Logan said. "And I knew I loved greenery so I told Les that I just wanted them to have greenery and then add some color in mine. I knew I wanted a wild bouquet because I don't like things to be perfect. And, that's what I got. I loved it!" Her bouquet also had a very special detail: her late grandfather's pocket watch. "That really meant a lot to me," she said. We sorta reinvented the flower crown for this wedding... Logan and her bridesmaids all wore small floral headpieces that were so uniquely STUNNING. One of my favorite details of their day, for sure! Logan's dress was an absolute dream bridal gown - it was from Inverness, and it was just as unique and stunning as the rest of their details. This dress was PERFECTION - the details, the texture, the silhouette, the neckline, and the veil! 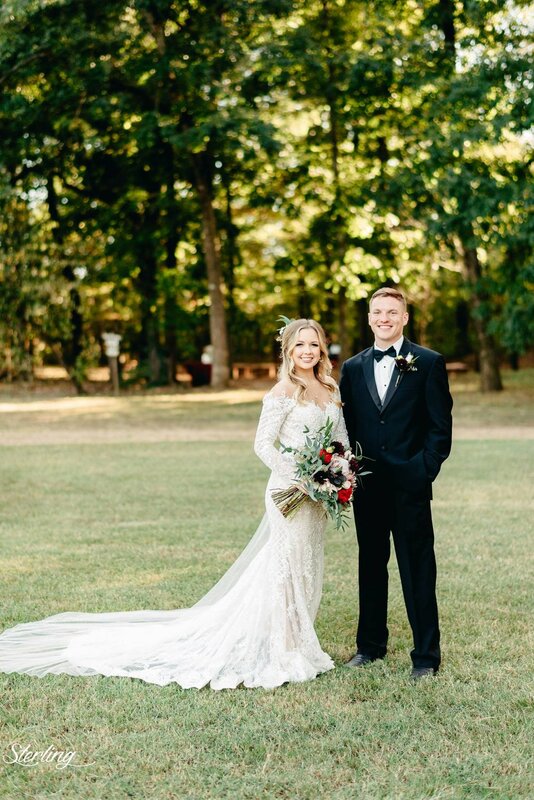 Logan, you are such a gorgeous bride! The bridesmaids looked chic in black floor-length dresses from ShowMeYourMuMu. 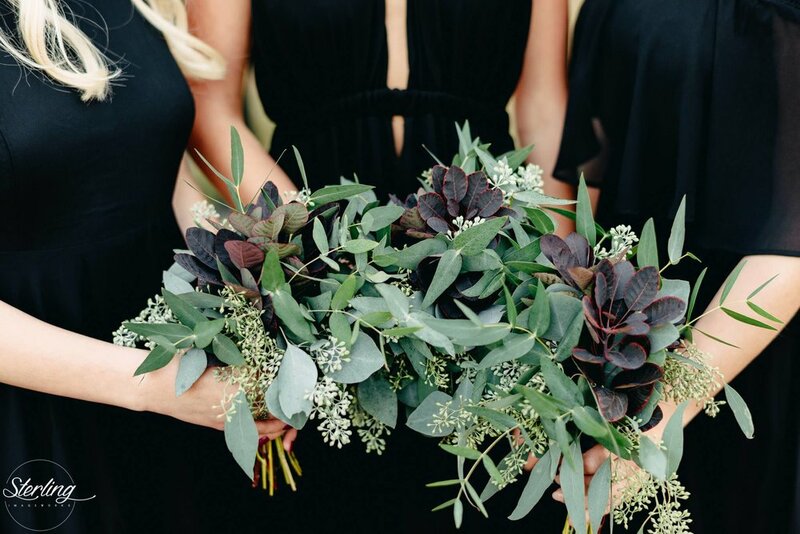 I love their different necklines and how timeless and elegant the black dresses paired with their greenery bouquets and the florals in their hair. The guys wore classic black tuxes - the best! Most gorgeous bridal party ever! Boots & bow ties... yes, please! Logan and Dusty had the sweetest first look before their ceremony. This was one of the most special first looks The Barn has ever seen, because of the fact that this land is where Logan grew up. 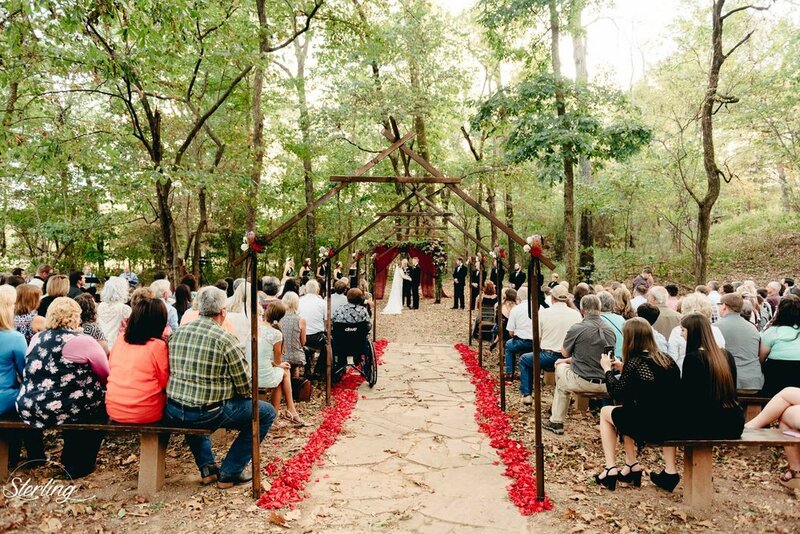 "My favorite part about getting married at The Barn is that it's home," she said. "It's where I have spent my entire life. I have ridden those pastures more times then I can count, played in the woods since I could walk, and you'll have to ask Les if I am making this up, but I swear we would swing on vines down the hill. I'm so blessed beyond belief that The Barn just happened to be in the perfect spot." Y'all, we're going to have heart eyes FOREVER over this ceremony! Their altar was a dream - the burgundy draping blew so beautifully in the breeze, and the bold colored florals and greenery were so, sooo pretty. And this aisle... one of the most beautiful and unique we've ever done! Their pretty little guestbook table (with a fun Polaroid guestbook alternative) was just the icing on the cake. "Lesleigh knew I wanted my ceremony to be different somehow because there have been so many ceremonies in that spot," Logan said. "We searched the entire pasture and decided I should leave it there because it's where my brother got married, and c'mon...it's just way to pretty to pass up. But, she did surprise me with a type of archway going down the aisle. It meant a lot that she would do that for me. Just having my sister be such a huge part of my wedding made it special to me and truly mine. Not to mention she also surprised me with the banjo that I wanted so badly at the ceremony!" Logan and Dusty's reception was magical! 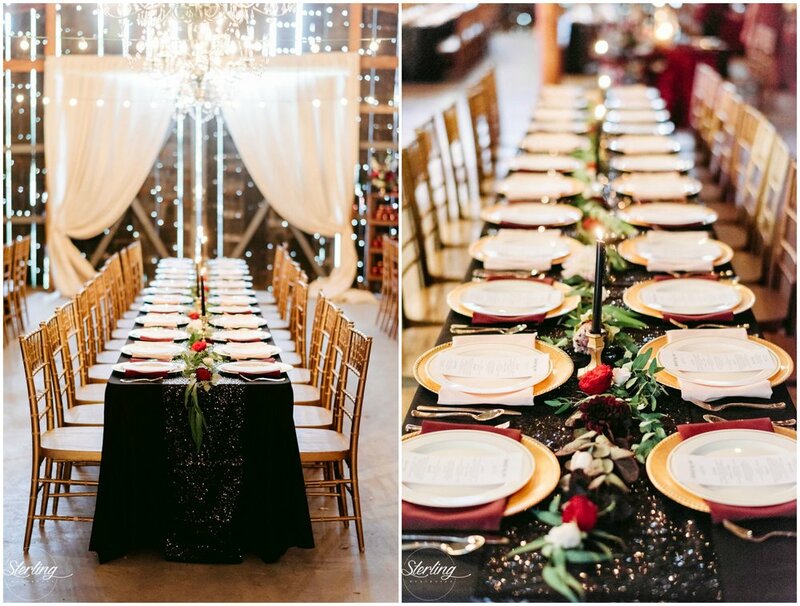 The black and burgundy linens on the tables were elegant and beautiful, and the black glittery runners made such a bold statement. The florals and greenery were stunning, and every little detail was perfect! "The black tapers were pretty dang awesome," Logan said. "The moment Lesleigh brought it up, my jaw dropped and all I could think was 'YUSSS!' Such a tiny detail, but I think they made the table arrangements." Logan's white and gold cake was elegant and timeless, and Dusty had a fun guitar groom's cake and yummy pies - the flowers on the pies were such a sweet detail! 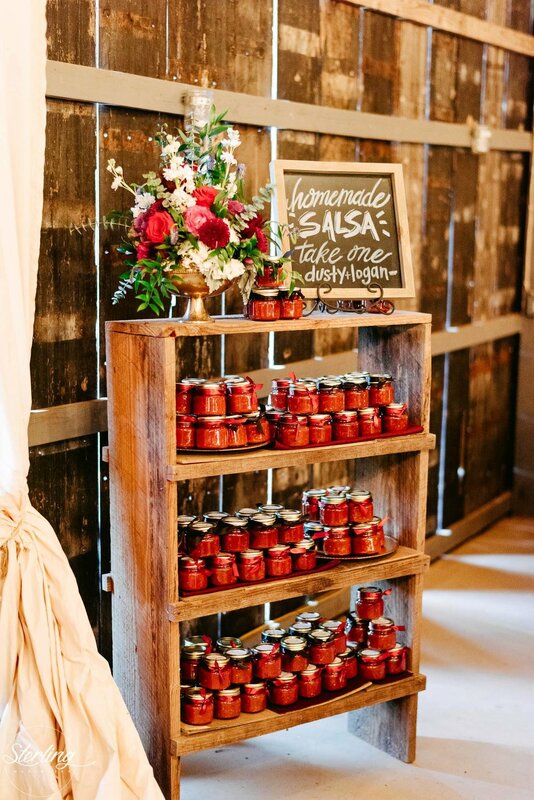 These two also had a reallllly great idea for their favors. "Dusty's mom Betty makes awesome homemade salsa," Logan said. "I asked her if she would mind making some for the wedding if I would help; of course, she said yes. I didn't get to help because when she was doing it all, I was in Colorado visiting Dusty. I'm a terrible daughter-in-law, but she didn't mind one bit. She made every ounce with love and I guarantee you that's why it's so tasty." Logan and Dusty shared their first dance as husband and wife under a greenery topped chandelier. One moment that Logan will never forget: her dance with her dad. "Oh gosh, my dance with my dad felt like it was never going to end," she said. "I was bawling my eyes out the whole time. I loved every moment of it, and it was so special, but I bet everyone was looking at me crazy! I'll never forget that moment though." After the most magical grand exit, Logan and Dusty went off on a two-part honeymoon! "The first bit we spent at a secluded cabin up in the Blue Ridge Mountains in Georgia right by the North Carolina border," Logan said. "Our cabin was perfect and the view was incredible. All you could see was forest and mountains. We would also watch the sunset on the back porch which was so beautiful and the perfect spot to do so. Sometimes we would watch it in the hot tub (which it was perfect hot tub weather) and it was just amazing. Our second part, we went to Nashville. Dusty has always wanted to go, so I kind of surprised him with the trip to Nashville on the way back and second row seats at the Grand Ole Opry. We got lucky because it was the Birthday Bash weekend so, they had a bunch of great artists that performed!" Logan said her wedding day was everything she could have hoped for! "Five star staff!" she said. "I changed my mind about some stuff a lot and (aside from Lesleigh) no one complained..to me at least ;)"